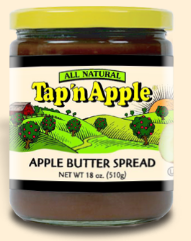 Tap 'n Apple sent me some of their AMAZING apple butter. I have always loved apple butter. It reminds me when I used to go to my Busia's house (grandma in polish) and she always used to have it. I have not had any for years and when I found this brand, I knew I had to ask the company if they would send me some to review. I opened the jar the second I got it in the mail and tried it on some crackers. It was SO good. I ended up eating like 1/4 cup in a sitting. Whoops! Then, I found out the most amazing thing. There is no sugar added. I could not have been happier finding that out! Also, there are only 20 calories in a serving. SO worth it. Thanks for the amazing product! that looks like such a great product! thanks for highlighting it; do they give out samples ever? I'm not sure. You can email the company and ask. I asked for it and they sent it to me for free!